These cute gingham mules are only $20! 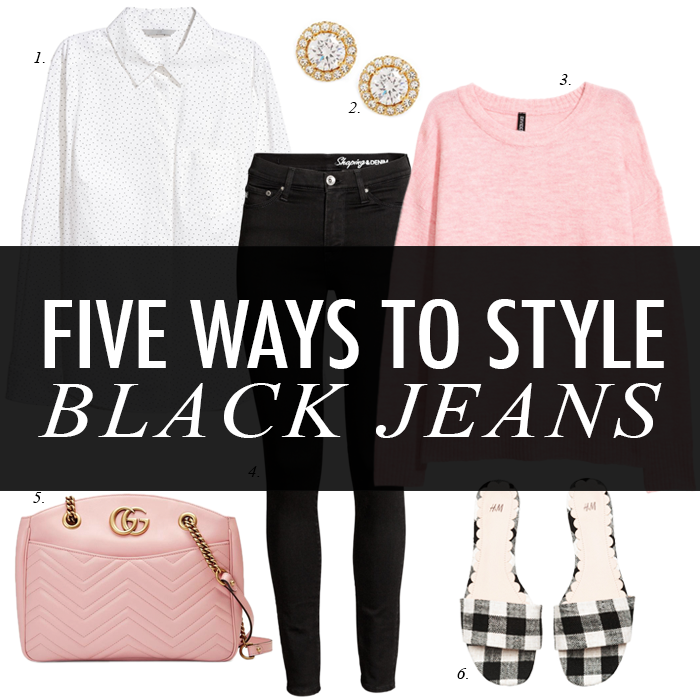 Today I am sharing five different ways to wear black jeans. I love my black jeans. I wear them each week - they are definitely a staple in my closet. These are probably my favorite black jeans. They are exactly the perfect high rise and length in the leg. They are perfect in the summer with sandals, or with pumps, and in the winter, they are not too bulky to tuck in my boots or with my ankle booties. If you are like me, you like to find multiple ways to wear one item that is in your closet. So, I am going to try to make more relevant content - that shows multiple ways to wear something each week. Is there something you would like to see styled different ways - leave a comment or send me an email. "How can you begin to make attitude adjustments now to help you maintain a good attitude the next time you find yourself up against a challenge? It may be as easy as saying, “I realize that life is not perfect but with God’s help I am going to be stable even during the storms of life.”"
This cute heart shaped ring dish comes with a saying, sparkle edge, or gold splatter). This "heart" card wallet - perfect year-round. This red v-neck sweater - also in other colors. This charm initial bracelet for $10. This snake mini top handle bag for only $38. This satin pink button front blouse (would be perfect for Valentine's Day). This super soft v-neck sweater for 25% off. Oh wow, these pinstriped jeans remind me of my younger days. I love this classic v-neck sweater. These leopard boots are an extra 60% off. This v-neck sweater is $12. I like this snake print blouse. This was a very popular blouse last year - and it's back for 40% off. I am always looking for some wear to work leggings like these. This pinstriped jacket is on sale for $28. This fun leopard sweater/sweatshirt is 75% off. Love these quotes, love these outfits and I’m proud of you! Have a great day friend! Black jeans are also my very favorite to wear! In the winter I easily wear them 2x a week. I actually re-created one of your black jeans outfit sets last weekend (not from this post) and can't wait to share it on the blog next week. :) I'm also happy to read you'll be doing more posts like this! They are so helpful! I hear you on the comparison game and the effort that it takes to stay positive! It really is something that requires conscious effort for me since I'm not the most naturally cheerful person. great styling as always Lisa!